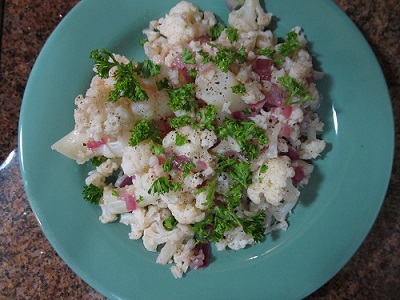 Cauliflower Salad ...a delicious way to use raw cauliflower. Cauliflower means "cabbage flower" and cauliflower is a member of the cabbage family as is broccoli, brussel sprouts, kale, and bok choy. 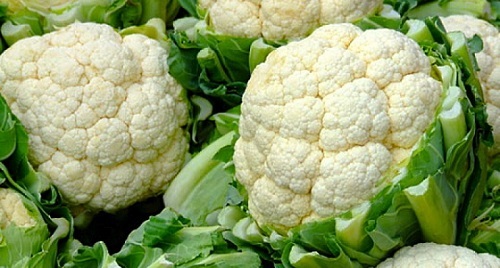 Only the head of the cauliflower with very densely packed white flower buds is eaten, a part known as the white curd. It is most commonly eaten cooked, but it may also be eaten raw or pickled. When cooking or preparing cauliflower, the outer leaves and thick stalks are removed, leaving only the florets. The florets should be broken into similar-sized pieces (usually bite size) so the florets cook evenly or are easily handled if eaten raw. Cauliflower has been an important vegetable in the United States since 1920. Almost all cauliflower grown in the United States comes from the Salinas Valley of California. Arizona, New York, Michigan, Oregon, Florida, Washington and Texas also grow some cauliflower. 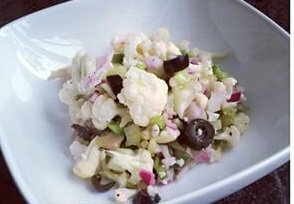 I serve this Cauliflower Salad or a variation of it (see notations below) when fresh cauliflower is readily available and when I am serving buffet style, at home or at the restaurant. 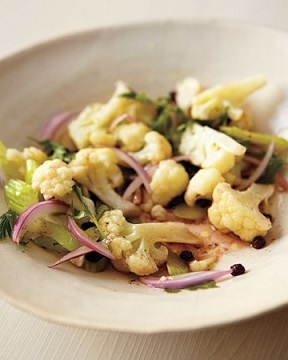 It is easy, and very good according to people who like cauliflower. It is also a nice change from cooked vegetables although if you prefer the cauliflower a bit softer, blanch it quickly and pour it into ice water to immediately stop the cooking process. Then cool and combine with the remaining ingredients. Bonus! This salad only has about 18.2 grams of carbohydrates per serving, assuming 8 servings. This is a great salad for those of you who are reducing your carbohydrate intake. Blanching is a cooking term that describes the process of food preparation where the food substance, usually a vegetable or fruit, is plunged into boiling water, removed after a brief timed interval and then plunged into ice water or placed under cold running water to halt the cooking process. Preparation time: 25-30 minutes. Serves: 8-10. 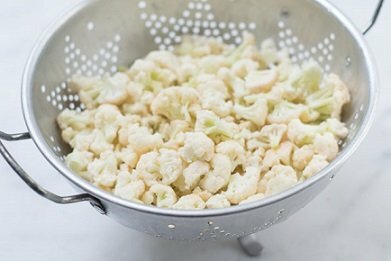 All kinds of options: You can add a variety of other vegetables to this basic cauliflower recipe such as peas and/or broccoli. Enjoy your cauliflower salad and the company of those you share it with!